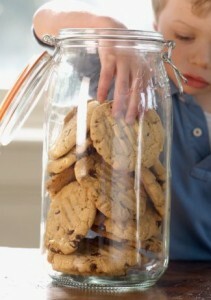 We often think of temptation in terms of the food we love to consume, that we shouldn’t indulge in. I have a very hard time passing on chocolate chip cookies for instance. I find potato chips to be so irresistible, that I’ve been known to take down an entire bag in one sitting. When the Bible talks about temptation, however, something quite different than indulging in a second slice of pie is intended. Temptation, quite simply, is the inclination to do something contrary to the will of God. Have you ever wondered where temptation comes from? We may want to claim that “the devil made me do it”, or perhaps we imagine that God is tempting us, but the Scriptures refute this. James explains “God…does not tempt anyone, but each one is tempted when, by his own evil desire, he is dragged away and enticed” (James 1:13,14). It is a humbling thing to learn that the greatest obstacle between me and obedience to God’s will is my own desires. The reason I am tempted is because, at some level, I am fond of that thing. This is what makes the fight against temptation so difficult–I’m fighting against something that I’m inclined to do. As a result, sheer will power won’t cut it. We need something beyond ourselves—we need God to intervene and to alter our affections. We need God to help as take down temptation at its root—we need Him to change our desires. I have a long way to go in terms of mortifying my desires that contradict God’s will, but I am encouraged by the words of Scripture. Paul explains to the Corinthians (and to us), “No temptation has seized you except what is common to man. And God is faithful; He will not let you be tempted beyond what you can bear. And when you are tempted, He will also provide a way out.” (1Corinthians 10:13). When I delivered a message on Overcoming Temptation at St. Andrew’s Kirk on August, 29, I encouraged the congregation to focus on the “way out” which God promises to provide. Not surprisingly, one of the primary ways in which we access this “way out” is through prayer. But I also cautioned about letting temptation get too close. Let me illustrate this by having you imagine someone jumping off a swimming pool diving board and praying, ‘Lord, please don’t allow me to get wet!’ Do you expect that the Lord would answer such a prayer? Yes, God can do the impossible, but in my experience God provides a “way out” long before we are in mid air. Followers of Jesus have every reason to be hopeful in their fight against temptation. May I invite you to have a listen to the audio below. I expect it may encourage you as you seek to overcome temptation, and as you endeavour to walk more closely with the Lord Jesus Christ. I was at a Pastors Conference in Chicago in the late 1990s when a question was put to Howard Hendricks, “Is it acceptable for a preacher to deliver the same message more than once?” (presumably in different contexts). I appreciated that response very much. As I was delivering my final messages at St. Giles Kingsway and The Well, from a series entitled, “Parting Words From Your Pastor”, my wife exhorted me to make these messages my opening words for St. Andrew’s Kirk in Nassau, Bahamas. This past Sunday, we began a message series entitled, “Foundational Priorities”. Within this 6-week series I am adapting and reusing a few of my messages from “Parting Words”. The first was “Understand The Gospel”—based on Ephesians 1 and 2. 5. We Reflect God’s Glory (Having been made alive, and having our nature altered by God’s Spirit, our lives become centred around glorifying Christ). Have a listen to the audio below. On April 11, I began a message series at St. Giles Kingsway and The Well entitled, “Parting Words From Your Pastor”. In that I will be transitioning to St. Andrew’s Kirk in Nassau, Bahamas at the beginning of June, I wanted to leave my congregation here with what I regard to be the 5 messages most vital to their spiritual wellbeing. Message number one is, “Understand The Gospel”. I understand that much more is required than simply understanding the Gospel. We must also believe the Gospel, we need to be living out the Gospel, and we need to be passing the Gospel message on. My thinking behind this particular emphasis is that if we have a thorough understanding of the Gospel there will inevitably be an overflow where we will have a growing inclination to live out the Gospel and to share the Gospel with others. So where in Scripture do we turn to, if we want to understand the Gospel? My conviction is that studying a single passage of Scripture will not exhaust the depths of the glorious Gospel message. There is the sense in which every book of the Bible has a part to play in the Gospel orchestra. But if we have to choose one passage, where might we go? John 3:16 is undoubtedly the most popular summary verse for the Gospel. The Book of Romans is widely regarded as providing the most thorough treatment of the Gospel within a particular book. Looking for something shorter, however, I chose Ephesians 2 to provide the basis for my message, “Understand the Gospel”. Within my message (the audio is available below) I outline what I discern to be the key components of the Gospel message. Rather than reproduce that outline here, I think it might be helpful instead to elaborate further on why I think understanding the Gospel is so vital for the follower of Christ. If someone were to assert that believing the Gospel is more important than merely understanding the Gospel, there is a sense in which I would agree with them. 19th Century theologian, Charles Spurgeon, using the analogy of a starving man, notes that a hungry man does not wait until he understands the composition of his food before he eats. A starving man, once he discerns that the food before him will satisfy his hunger and not harm him, immediately indulges. If the Gospel has the capacity to save and satisfy our souls apart from our fully comprehending it, why fuss over the fine theological details? Staying with the analogy of food, my answer is that once we have tasted the Gospel our status changes. Having been fed by the Gospel, we take on a new responsibility to feed others with the message we have received (see 2Timothy 4:1-5). When we were starving we may not have needed to know the composition of the food that satisfied our hunger, but as a servant of Christ we do need to be able to recognize the authentic Gospel dish as it sits among a plethora of imitation dishes. Thankfully, we’re not called to cook up this message. The Gospel has been perfectly prepared and is sufficiently conveyed within the Scriptures. Our task is simply to deliver what has already been prepared without making a mess on the way to the table. Of course, serving the Gospel is far more important than serving a meal. But this is all the more reason to increase our familiarity with this soul transforming message. If you have been fed by the Gospel message, I want to encourage you: Understand the Gospel so that you will be able to feed others. Paudler is one of two children my wife and I sponsor through Compassion Canada. Paudler lives in Haiti. It has been more than a week since the devastation began in Haiti as the result of a 7.0 earthquake. I continue to be stunned and saddened by the reports I’m hearing—tens of thousands, possibly over a hundred thousand perished from this disaster. I gave it a few days before I emailed Compassion Canada to see if there was any news on Paudler. The reply I received was prompt, but sobering, “we do not have any news about specific sponsor children”. Five thousand Haitian children are sponsored through Compassion. The coverage of this disaster in the media has been extensive, to say the least, on topics ranging from the history of Haiti, to the logistical challenges of dispersing aid, to the strategies for rebuilding, to the role of God and faith. And since I am not a historian, a medical expert, or an engineer, I will confine my comments to the latter subject. God is not absent from this disaster. He is not a helpless bi-stander. Jesus reminds us of the constant care of our Heavenly Father when He asks, “Are not two sparrows sold for a cent? And yet not one of them will fall to the ground apart from your Father” (Matthew 10:29). The disaster in Haiti did not catch God by surprise. What shall we conclude then? Many are asking, “Why Haiti?”, “Does God hate Haiti?”. Very few of the answers to these questions I have come across have been helpful. One answer in particular, from a well-known televangelist, was outrageously insensitive. But I did come across one article written by Albert Mohler Jr. that I found to be both theologically sound and hope-inspiring. (if God) hated Haiti, there would be no missionaries there; there would be no aid streaming to the nation; there would be no rescue efforts—there would be no hope. The earthquake in Haiti, like every other earthly disaster, reminds us that the creation is groaning under the weight of sin and the judgment of God. This is true for every cell in our bodies, even as it is for the crust of the earth at every point in the globe. The entire cosmos is awaiting the revelation of the glory of the coming Lord. Creation cries out for the hope of New Creation. In other words, the earthquake reminds us that the Gospel of Jesus Christ is the only real hope. The cross of Christ declares that Jesus loves Haiti—and the Haitian people are the objects of His love. Christ would have us show the Haitian nation His love, and share His Gospel. In the midst of this unspeakable tragedy…Christ’s people must do everything we can to alleviate the suffering, bind up the wounded, and comfort the grieving. The blog post which preceded this video (below) can be found here. Rachel’s perspective on suffering and death is immensely powerful and inspirational. This is life-changing stuff. Thank-you Rachel. Note: The video may take a moment to load, and begins with some introductory text. 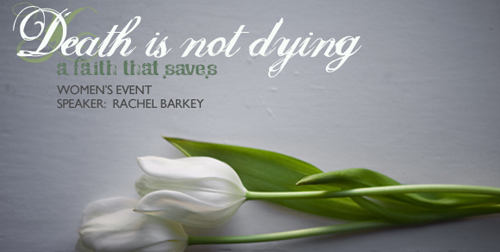 To learn more about Rachel, and her story, visit: http://deathisnotdying.com where you will find “Letters from Rachel”, along with relevant book and website recommendations.